Heated outside terrace for diners or to enjoy our master craft cocktails. 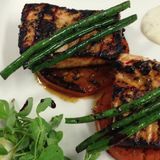 What did you think of Banyan on the Thames? Impeccable service, delicious food and cocktails, very friendly staff, VERY reasonable prices, welcoming atmosphere, great variety and quality of spa treatments, cosy and clean shisha space (hard to find), beautiful views on the river Thames, clean rooms, luxurious decor, recently built so the latest technologies and trends inside this fabulous hotel. 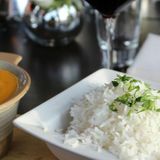 I went to Banyan for an early dinner on Saturday 12th March 2011. What an amazing restaurant. The service was impeccable and the food was delicious. The waitress was extremely attentive, but not over pushy. There were so many dishes I wanted to try, I will have to go back at least 6 times. We were a table of 4 and we all chose different dishes, I could not fault anything. The owner came and introduced himself to all tables and the complimentary canapes' from the visiting French chef were to die for. With beautiful views and the added excitement of a helicopter taking off and landing whilst we were dining, I could ask for a idyllic setting. Michelin star quality and service through and through! A grand restaurant and a fabulous addition to London: Price to value is a bargain. It is a first-rate setting, I had Fish honey glazed a good recipe and my partner opted for T bone steak, Fish and Steak are not province of any restaurant if it is gastronomically not well prepared for these very difficult preparations; they were quite good in making the preparation the way we wanted. The steak was very nicely presented with delicate brandy sauce and Fish with honey and spices was heavenly, though something new and was my first experience it tasted very well. Absolutely meticulous arrangement and view over the entire bend of Thames. We paid half of what we will pay in Paris for comparable food. 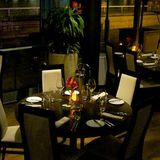 I decided to go by the popular 800 plus ratings on Top Table and ate today( Sunday) at 'Banyan on Thames' the restaurant was lively, vibrant . The bar was alive and serve great Cocktails, the food was striking and of exceptional value even before the discount, with 50% discount it is a bargain. I rate Banyan as one of the best values in London on taste and price, the cocktails at the Rafayel are special and are awe-inspiring . I have posted this review on Crystal Bar too. Don't know if we just caught them on a bad night but what should have been wonderful turned into Fawlty Towers type service. Arrived at the lovely looking restaurant. Would have overlooked the river had a large Range Rover not been parked in front of the window. Drinks orders were taken 40 minutes after we were seated. After we had ordered our food we waited a further 20 minutes for the drinks to arrive. After a further 40 minutes I was told that my starter was no longer available. I don't know whether they burned it or dropped it or did not see what I had ordered but it felt a little late to let me know when I was already wondering if we were ever going to be fed. Main course arrived which was beef and was so tough was like leather. I sent it back and asked for the chicken tikka masala. The plates in this place are beautiful but totally impractical to eat off. They give you two bowls on a wooden tray. One bowl is full of curry and the other is full of rice. Trying to mix them together was almost impossible and resulted in taking one fork of curry and another of rice. We had a 50% off food offer which we were glad of as we will not be returning. 3 1/2 hours to serve 2 courses is unacceptable in London. Don't go here unless you have a lot of time to wait and are not very hungry. Rafayel on the Left Bank has to be considered as the "jewel" of the Left Bank. It is a brand new eco-friendly hotel, located on the Left Bank of Thames River. The hotel has about 50 large noise-free, well-decorated, clean, comfortable with floor to ceiling windows allowing natural light in the room. The bathroom are large and the showers are equipped with Thermostatic Shower and rain shower head. As amenities the hotel offers free internet access (wi-fi and wired service in the room), the access to the River Wellbeing Spa, a well equipped Fitness Club, a Conference Room, a Meeting Room, a Roof Terrace overlooking Thames River and the the London Heliport. The hotel offers free shuttle transfer to the nearest tube located at Sloane Square, the staff is exceptional from the time that the reservation is made to the arrival to the hotel. During the stay the staff has been very friendly, warm, nice, inviting and polite. I will definitely will come back and refer the hotel to anybody else. The staff and the owner of Rafayel on the Left Bank has been exceptional during my stay in January 2010 and catered to my needs. Thanks again a wonderful and enjoyable stay at your hotel. Jerry. Battersea has a swish new hotel, Hotel Rafayel, a bit off the beaten track but convenient for the heliport whence it presumably hopes a portion of its upmarket trade will come. Within is a sleek, riverside restaurant of considerable ambition and culinary diversity which could soon be a valuable addition to the area. The restaurant is situated deep in the hotel, invisible to passers-by and with no external signage, so it will need to generate good word-of-mouth amongst locals and to entice in hotel guests to succeed. Once you've navigated reception and crossed a courtyard, you encounter an impressive curving bar of illuminated panels, then a dining area of about 100 covers with a huge swathe of floor-to-ceiling windows taking in the Thames. Outside is a substantial terrace where summer dining would be a treat. There are more atmospherically lit panels and plenty of woods of differing hues. It's all clean and uncluttered in the way of modern, riverside apartments but avoids austerity. 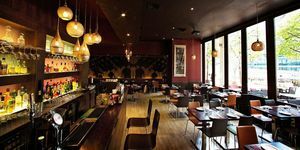 On a weeknight soon after opening, customers are understandably thin on the ground but it doesn't affect the warm, relaxed ambiance created by that moody lighting, and gently funky chill-out musak played at just the right volume. (This later changes to Frank Sinatra swinging with a big band which is a bit of a mistake.) Staff are terribly sweet and eager to please but occasionally inclined to tentativeness and not very clued up on wine. The short menu is a mini tour of the world, taking in Italy, Britain, France and Greece but leaning disproportionately towards India. Slices of ciabatta are fine but unremarkable, as is a dish of oil and balsamic to dip them in, but at least it's all complimentary which is often not the case these days. A starter of smoked salmon with beetroot shavings and horseradish creme fraiche is good but misdescribed, which turns out to be a theme of the evening. The generous portion of Invawere salmon is of the highest quality - and so it should be at £9.40 - and confidently smoked but its horseradish creme fraiche is feeble. Why the beetroot shavings have mysteriously turned into admittedly deliciously sweet beetroot puree is never explained, whilst a scattering of hefty capers is welcome. Presentation is fabulous with the components in regimented rows on a rectangular plate. Sauteed king prawn salad with lime aioli (£7.25) is again much enjoyed and beautifully presented, this time in the manner of a Jackson Pollock splatter painting in a rather unstable glass bowl. The warm prawns are delicately and complexly spiced. They aren't huge but there are plenty of them. The lime aioli doesn't get much of a look in but an accompanying cherry tomato, yellow pepper and rocket salad works a treat. From five global mains plus seven (mainly Indian) from the tandoor and grill, fish and chips (£14.90) is pretty good but, once again, inaccurately described. The fish, innovatively, is monkfish which can easily go tough and rubbery. Here, it couldn't be more tender or tasty, whilst its tempura batter is feather-light. The accompanying chips aren't right at all, though, being neither mash-like enough within nor crisp enough without, and where is their promised chilli salt seasoning? They are stacked like a game of Jenga which is rather old hat. Again without explanation, the promised pea puree has become a little bowl of chilli jam. It's lovely but bound to disappoint those salivating at the thought of mushy peas. Fillet steak (£19) is an accurately-cooked, generous slab of tender, flavoursome, highest quality protein served with intense - perhaps overly intense - shitake mushrooms, still crunchy green beans with a hint of sesame, and what is described as rocket puree but turns out to be potato puree flecked with rocket. A side of buttered asparagus (£3.95) is a rather parsimonious portion of seven spears rendered borderline inedible by severe over-salting. Onto dessert. Chocolate Bailey's cream cup (£6.50) consists of a big glassful of splodgy cream laced with the famous Irish liqueur and containing unwieldy, hefty lumps of crunchy biscuits and incongruous little dice of dried fruit. Far, far better - but again, misleadingly described - is caramelised Indian rice pudding served with toasted almonds (£4.95). It is a deliciously creamy rice pudding that granny would have been proud of (though she wouldn't have served it cold, of course) with a perfectly bruleed top, but there is no scent of cardamom, scattering of pistachios, trace of rosewater, nor anything else to mark it out as Indian. The wine list comprises thirteen sparklers, three organics, two roses, 18 whites and 16 reds but not a single dessert wine, a bizarre omission for a restaurant at this level. Prices are more than fair, however, starting at £14 with plenty of interesting options under £25. You can blow £120.95 on top-of-the-shop white Corton-Charlemagne Cru, Domaine Louis Jadot, whilst the most expensive Champagne is Louis Roederer Cristal at £250. One Champagne, two roses, four whites and four reds are available by the glass. Fortant de France Sauvignon Blanc (£3.50/£14) has plenty of characteristic zingy gooseberry-ness and is very decent for a house wine. Kleine Zalze Barrel Fermented chenin blanc (£4.95/£19.95) is a tad more sophisticated with vanilla and mango notes. Veramonte Merlot Reserva (£4.95/£21.95) is moreishly velvety with plenty of red fruits on the nose. 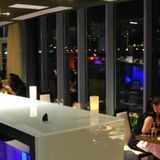 Banyan on the Thames is a stylish, modern, welcoming restaurant with a glorious riverside location. Three courses and half a bottle of modest wine will set you back £45-£50 which is very fair for establishments of this sort. Most commendably and unusually, no service charge is added to bills. Let's hope sufficient customers seek out this attractive, tucked-away place which, with some culinary tweaking and more authoritative service, could become a hidden gem.